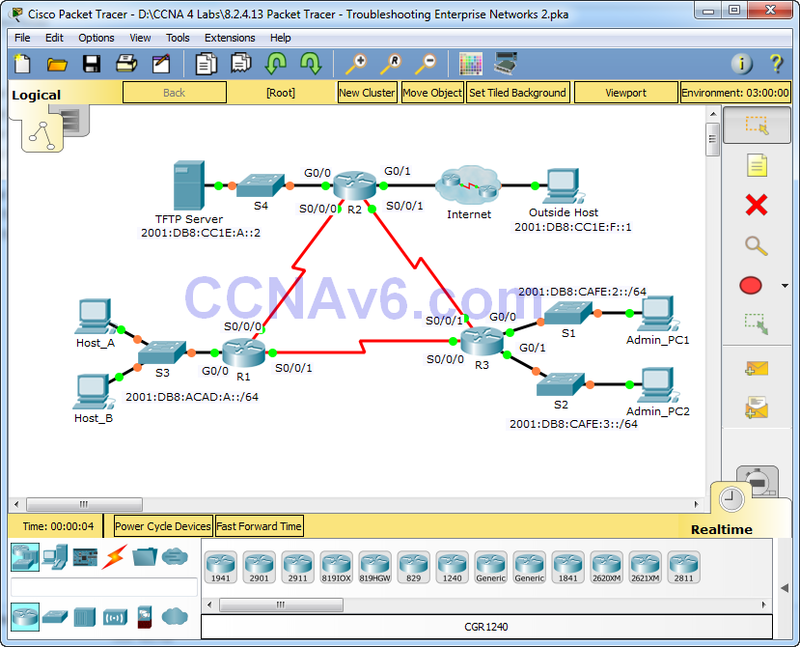 This activity uses IPv6 configurations that include DHCPv6, EIGRPv6, and IPv6 default routing. Your task is to review the requirements, isolate and resolve any issues, and then document the steps you took to verify the requirements. · Host_A and Host_B are assigned through IPv6 DHCP configured on R1. 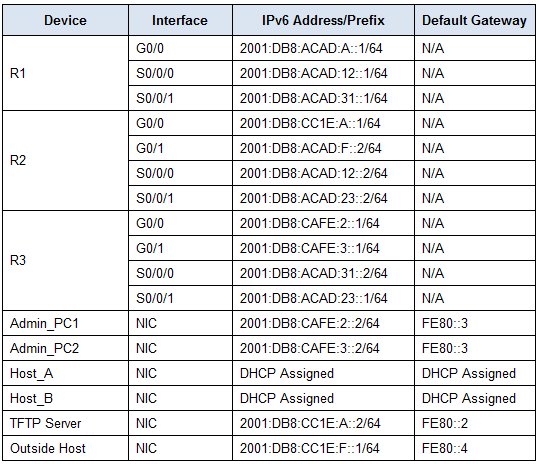 · Each router is configured with IPv6 EIGRP and uses AS 100. · R3 is advertising a summary route to R2 and R1 for the two R3 LANs. · R2 is configured with a fully specified default route pointing to the ISP. · Devices should be configured according to the Addressing Table. · Every device should be able to ping every other device. Capture output from verification commands and provide documentation proving that each of the requirements has been satisfied. 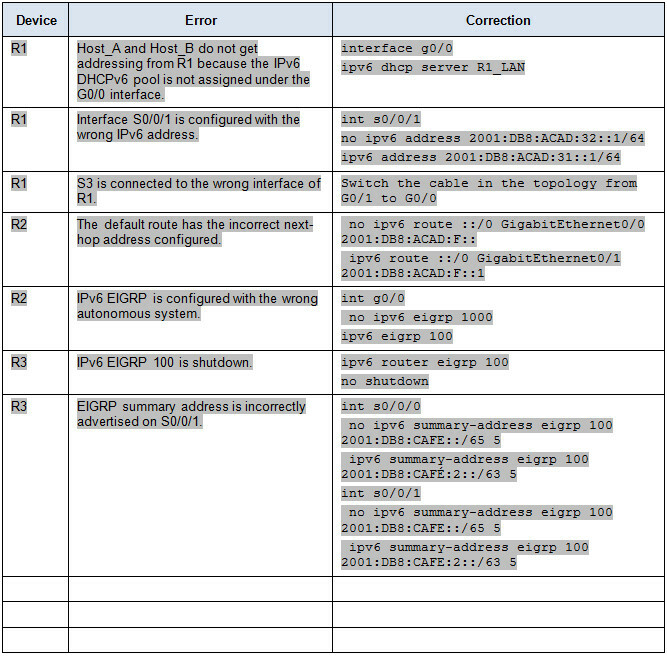 Note: Some EIGRPv6 commands are not scored in Packet Tracer v6.0.1. Your instructor will verify that all requirements are met. Instructor’s Note: The answer key for this section is left blank because there are many ways to verify the requirements. For grading purposes, note that the EIGRPv6 summary routes are not graded in Packet Tracer. Also, Packet Tracer does not grade the next hop address in the fully specified IPv6 default route. Check the student’s file to verify configurations. Packet Tracer scores 50 points. The troubleshooting documentation and instructor verification is worth 50 points.